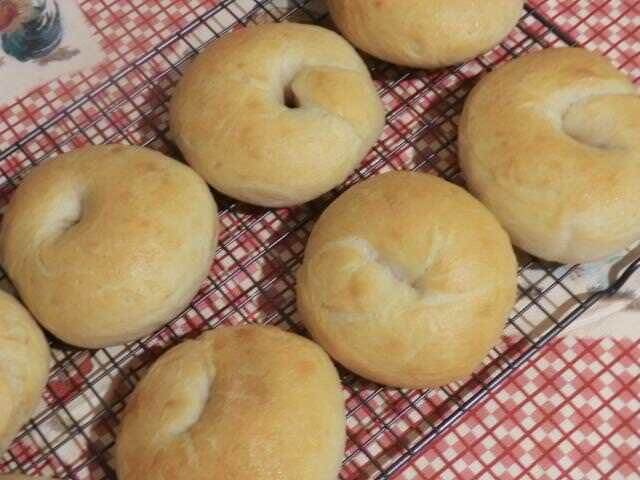 Sourdough Bagels | Cooking is Fun … Really!! My sourdough starter jar was getting a bit full (relatively speaking, as it was in a BIG jar, rather than my usual 2 cup one) so I had planned on refreshing the contents by making a batch of sourdough flour tortillas. 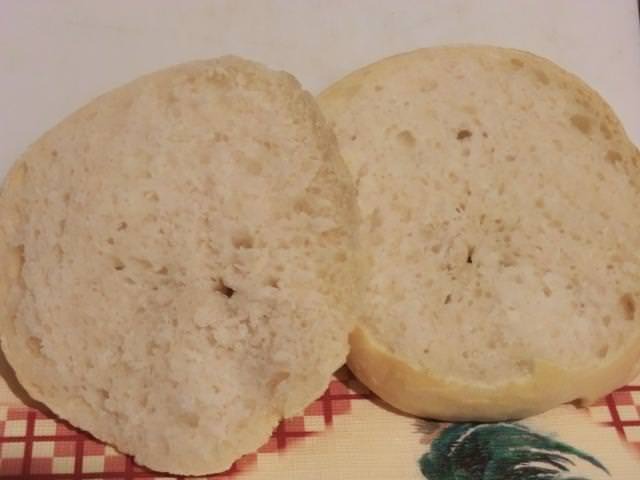 And then I was inspired by a themed post on a FB group I belong to to make sourdough bagels. After posting a request for a recommended recipe, I decided on the simplest of the bunch, which I actually found by net-surfing. And it only made eight bagels, which was perfect as my upstairs freezer is getting VERY full, again. I used up the last drop of starter in the jar (though I’ve got a couple of jars of dried starter in the pantry) so I won’t have to do weekly starter feedings for a while. The results were very tasty, dense and chewy in texture. Breaking out the stand mixer to knead the dough was a smart idea as that’s a tough dough to knead by hand. 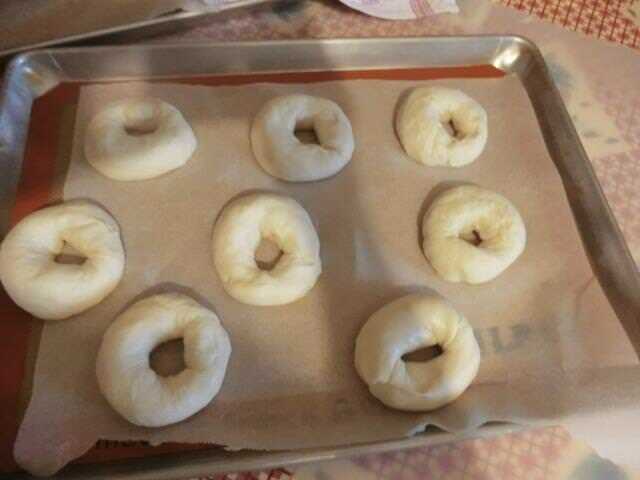 And, although the bagels weren’t shaped as nicely as I’d hoped, none of them came undone during the boiling step even though I used the “sealed rope” method of shaping. 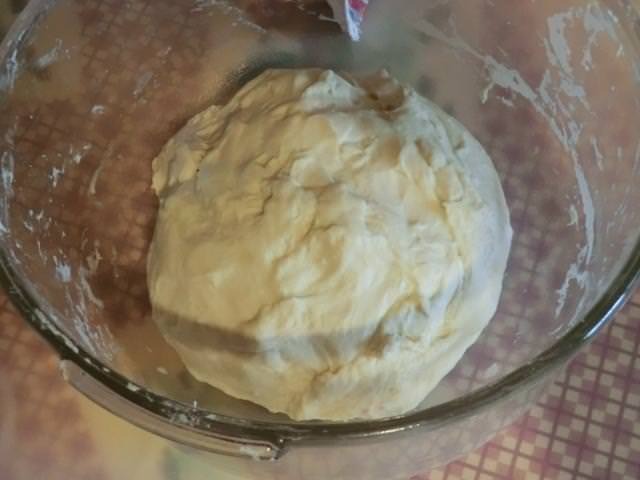 The hydration of this dough meant that the two ends stuck together during the shaping, especially as I didn’t use additional flour when rolling out the dough into a rope. Even though the bagels spread during refrigeration and I was sure I was going to end up with bagel pancakes, oven spring during the baking gave them a nice lift so they were plump and lovely. Crumb – Sliced into while still warm, because who can resist a bagel fresh out of the oven? I know I can’t. Looks intriguing, but not my thing. Enjoy your carbs while you can! LOL … I used to eat less bread when I was younger. And I, more! Funny how things work in different ways for different people. You cannot go wrong with sourdough bagels. They turned out well, I thought. 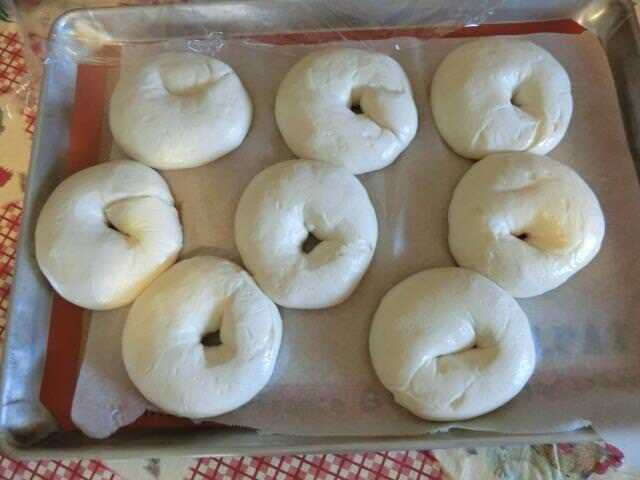 What beautiful big fat bagels, and like everything you make they look perfect! I wish I had one right now! They look wonderful! In every single version! 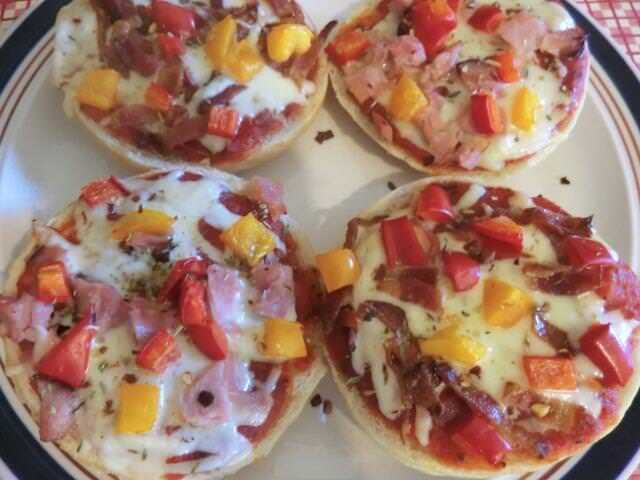 Bagel pizza is probably my favourite: I can imagine tweaking it depending on what I have in the fridge. Thank you. I’ve got a lot of other alternatives for pizza bases in the future but the pizzas were a good way to use up the various scraps of veggies, sauce, ham and bacon I had around. 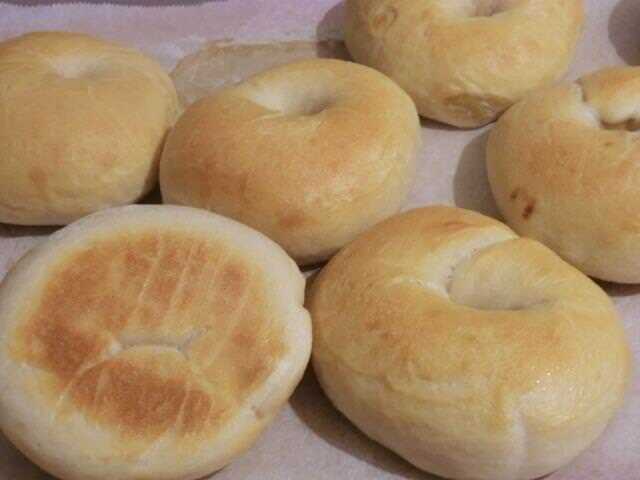 I’m a big Montreal bagel fan, but I must say these ones look wonderful. So plump, I can just imagine sinking my teeth into one. I’d love a bagel, lox and cream cheese. 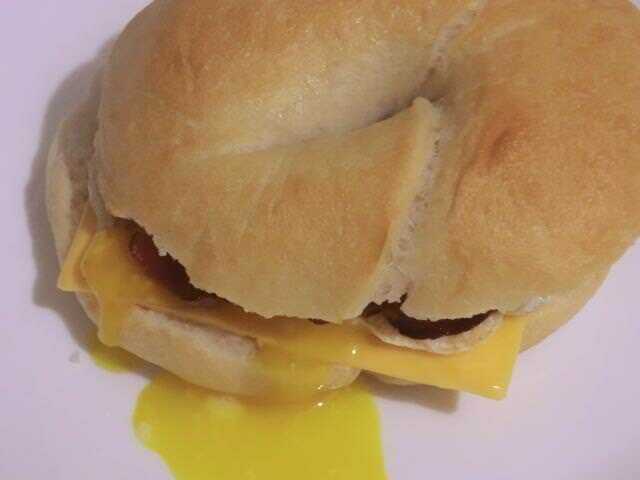 One of my favourite ways to eat a bagel. Raisins and a bit of cinnamon next time for a nice breakfast bagel.